Use these links to view a map of Jerusalem through the ages. Be sure to read the descriptions below the map. By the time of Christ, King Herod the Great had expanded the Second Temple making it into a gloriously large structure, much larger than Solomon’s temple. It included Antonia’s Fortress to the north. On the west side of the city, Herod built the Citadel Towers and his palace just to the south. The traditional spot for Calvary was just outside the city wall, on the northwest side of the city. After rejecting Christ, the Temple was destroyed by the Romans in 70 AD, just as Jesus had prophesied in Matt 24:1-2). 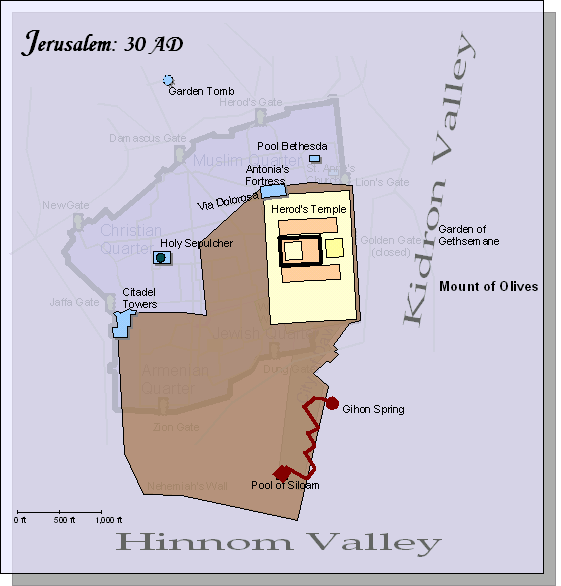 This map depicts the walls of Jerusalem in the time of Christ.